With over 6 million people using Invisalign aligners, they’ve become the most trusted incognito way to tidy up your teeth. You may be lost in dreaming of your straighter smile, but you can’t forget to maintain them so you can reach that dreamy grin you’re looking forward to. Just because they’re easy to maintain doesn’t mean can get away with not taking care of them at all. You want to make sure they function to straighten your smile for the duration of your treatment process. Read on to know how Invisalign aligners in Sunnyvale can be best taken care of to deliver ideal results. It’s important to rinse your aligners every time you remove them to prevent bacteria buildup. If you don’t, they could get smelly and contribute to bad breath. This can also prevent them from becoming stained or discolored. Your aligners may straighten your teeth, but they don’t protect them against harmful decay-causing food debris and gunk. Soaking your aligners is a great way keep them clear and looking new. It’s recommended that you use denture cleaner, special Invisalign cleaning crystals, or a 50-50 mix of water and vinegar for 15-30 minutes. 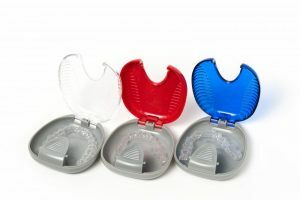 While it may seem like your trays shield your teeth, it’s easy for bacteria and food to become trapped underneath them. Be sure to continue to brush twice a day, floss, and use antibacterial mouth rinse to prevent decay and infections from occurring. The best way to rid your trays of harmful, foul-smelling bacteria is to clean them regularly with non-colored soap. Cleaning products with harsh chemicals can cloud their practically invisible look and could damage them. Gently brushing your aligners is a great way to remove plaque and tartar that attach to them. But remember to just use water and not use toothpaste. Fluoride hygiene products can be too abrasive and create little scratches that bacteria can sneak through. Every time you sit down for a meal or get a snack, it’s important that you take your aligners out. This will help keep them from becoming discolored or smelly. You can drink water with your trays in, but remember that chewing with your aligners in could break them. While it’s easy to forget about your trays laying around when you take them out, it’s best that you bring your case with you wherever you go. Leaving them uncovered leaves them more vulnerable to collecting germs and harmful bacteria that can affect your oral health. If you have any questions about your trays, be sure to ask your dentist in Sunnyvale so they continue to work at straightening your smile. Leaving them to collect grime and germs not only is bad for your oral health, but it will cause them to scratch and cloud, affecting your smile. With the proper care, your aligners will make your dream smile a reality in no time! Dr. George Philip strives to provide all his patients with bigger and brighter smiles than when they came in. He values each relationship he builds with his patients and wants to give them individualized treatment that they feel confident about. For any questions about Invisalign or to schedule an appointment, visit his website or contact him at 972-961-4105.